Vertically aligned carbon nanotubes (VACNTs) have promising mechanical properties for use in a variety applications including, for example, as energy absorbers and as compliant thermal interfaces. A fundamental understanding of their mechanical behavior is needed to provide the basis for design in such applications as well as in applications where mechanical performance may not be the primary objective. A compressible elastic-viscoplastic constitutive relation is developed to model the inelastic behavior of VACNTs. This constitutive model is then used in finite deformation, finite element analyses to model the response of VACNTs under various imposed loadings, including uniaxial compression, unixial tension and indentation. The effects of material parameter variations on the mechanical response are also considered. Results of the analyses are compared with experimental observations. A basic issue is extracting material properties from measurable quantities such as loads, displacements and strains. A simple one dimensional model is described that reveals some of the issues in doing this. This is joint work with Shelby Hutchens, Nisha Mohan and Professor Julia Greer of Caltech. Alan Needleman completed his Ph.D. in Engineering at Harvard University in 1970. He then spent five years in Applied Mathematics at MIT before moving to Brown University where he became Florence Pirce Grant University Professor in 1996. 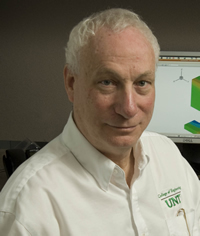 He retired from Brown in June 2009 and is now Professor of Materials Science and Engineering at the University of North Texas. His contributions include the development of a ductile fracture computational methodology, the development of cohesive surface methods for fracture analysis and creation of a framework that enables using discrete dislocation plasticity to solve general boundary value problems. Professor Needleman was awarded a Guggenheim Fellowship in 1977, and is a member of the National Academy of Engineering and of the American Academy of Arts and Sciences. He has been awarded the Prager Medal by the Society of Engineering Science, the Drucker and Timoshenko Medals by the American Society of Mechanical Engineers and has been recognized by ISI as a Highly Cited Author in both the fields of Engineering and Materials Science. Professor Needleman also holds honorary doctorates from the Technical University of Denmark and Ecole Normale Superior de Cachan (France).